Worry balls are anti-frustration spheres that you place on desks in offices, etc. For some magical reason holding a ball in the hand and squeezing it helps in the thinking process. A recent article in USA Today detailed the therapeutic value of excersizing small muscle groups by squeezing, etc. I have sold these spheres around the world as exercise devices for executives. You don't have to be an executive to appreciate them; anyone who has a desk will love one of these! 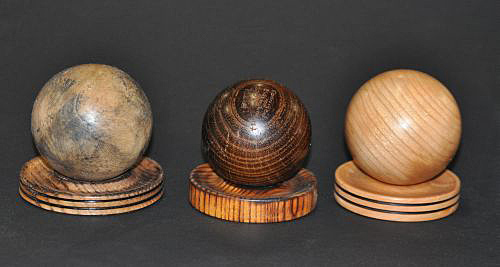 The spheres are made from a number of hardwoods. They rest on a base that is from the same type of wood as the sphere. They are approximately 2½ inches in diameter. There will be various irregularities in the wood that add character to the spheres. These make wonderful gifts for that person who sits behind a desk all day. Each time they pick it up to roll in their hand they will be reminded of your thoughtfulness. They are available in either cherry or oak with a matching stand. This is another unique gift for that hard-to-please person on your Christmas list.